With the official start to the NFL season less than a week away, the Buffalo Bills are still uncertain who their quarterback will be in Week 1. 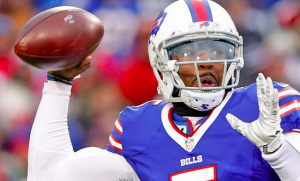 Incumbent starter Tyrod Taylor has been in the league’s concussion protocol for over a week after suffering a head injury during Buffalo’s August 26 preseason game against the Ravens. If healthy, there’s no doubt he’ll be the starter. But the Bills are quickly running out of time and have started to make contingency plans. If Taylor isn’t out of the NFL’s concussion protocol soon, the Bills are prepared to start rookie Nathan Peterman in Week 1 against the Jets. The Bills took Peterman in the 5th round of this year’s draft. After beginning his college career at Tennessee, Peterman transferred to Pittsburgh and soon became the starter. In two years at Pitt, Peterman threw 47 touchdowns and just 15 interceptions, completing over 60% of his passes. During the preseason, Peterman posted a 75.6 quarterback rating, giving the Bills confidence that the rookie is ready if called upon. In addition to Taylor going through concussion protocol, backup T.J. Yates is also recovering from a concussion, which could make him unavailable for Week 1 as well. In preparation for entering the season without both Taylor and Yates, the Bills announced the signing of Joe Webb on Monday. Webb was released by the Panthers on Saturday after three years in Carolina. In addition to being a backup quarterback, Webb has also been used as a kick returner and receiver during his NFL career. He brings slightly more experience to the quarterback position than Peterman. However, he hasn’t thrown a pass in a regular season NFL game since 2011. However, Webb is not expected to be anything more than an emergency backup for Peterman if both Taylor and Yates are unavailable for Week 1. That would be the worst-case scenario for the Bills. McDermott may have confidence in Peterman, but the Bills would prefer for Taylor to return in time for the season opener. The Jets are expected to be one of the worst teams in the NFL this year. Starting a late-round rookie like Peterman would cast some doubt over the near certainty that the Bills should be the Jets in Week 1. Considering the state of the Jets, this is not a game the Bills can afford to lose. But with lingering uncertainty over Taylor’s health and availability for Week 1, the Bills are still scrambling to figure out who their quarterback will be in Week 1.